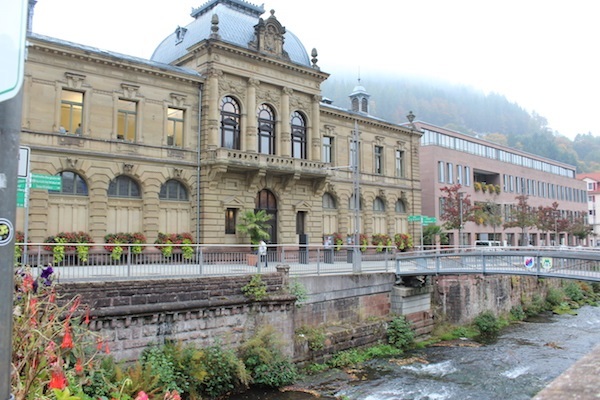 The town of Bad Wildbad in the Black Forest has been attracting tourists for over centuries. 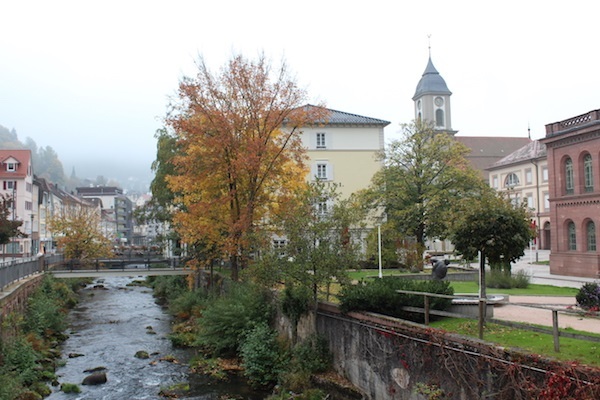 The little tributtosary leading off the Neckar into this village is the Enz river and runs through the center of town. 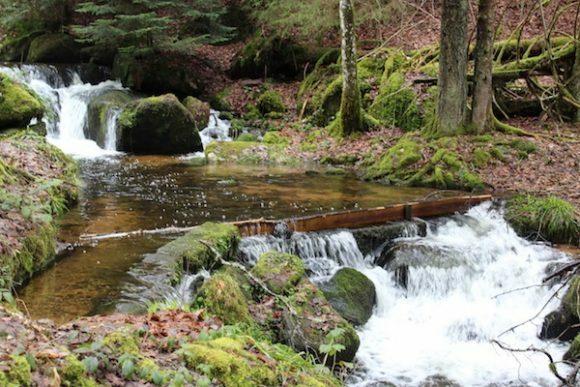 With fertile soil, warm water springs and natural beauty you can immediately see why nature, peace lovers and tourists would be attracted to this tranquil destination located in the north Black Forest. Although my first visit to Bad Wildbad was in the winter and not in full spring or summer bloom, I could still see the beauty of what warm weather would bring. The König-Karl-Straße or main street is lined with boutique stores and eateries that invited us in. We found a precious tea shop and owner who treated us to sweets and a warm drink. Parking is quite easy at the Parkhaus Stadtmitte and street parking was tricky because of narrow one-way streets. The Parkhaus put us very close to city center and within walking distance from the Rathaus (courthouse), information center and Evangelical church. Our stroll through town was filled with statues and monuments. One was dedicated to Gioachino Rossini, the Italian composer who once visited. Here you see him taking a dip in one of the thermal spas. Each summer Bad Wildbad has a Rossini Opera Festival celebrating his music and song. 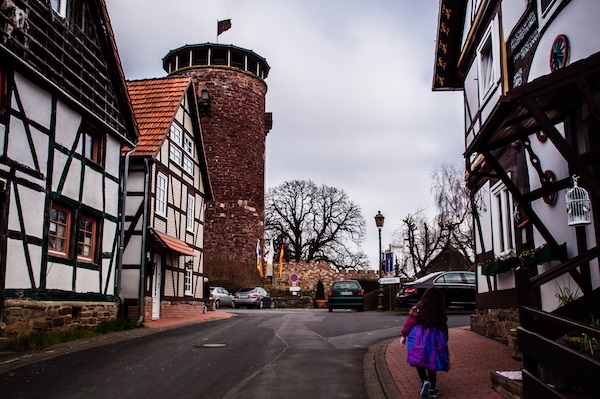 If you are new to the Baden-Württemberg area, you might recognize that many towns in our county begin with “Bad.” This word is synonymous with health and relaxation usually involving mineral springs or warm and hot springs that are in or near these towns. 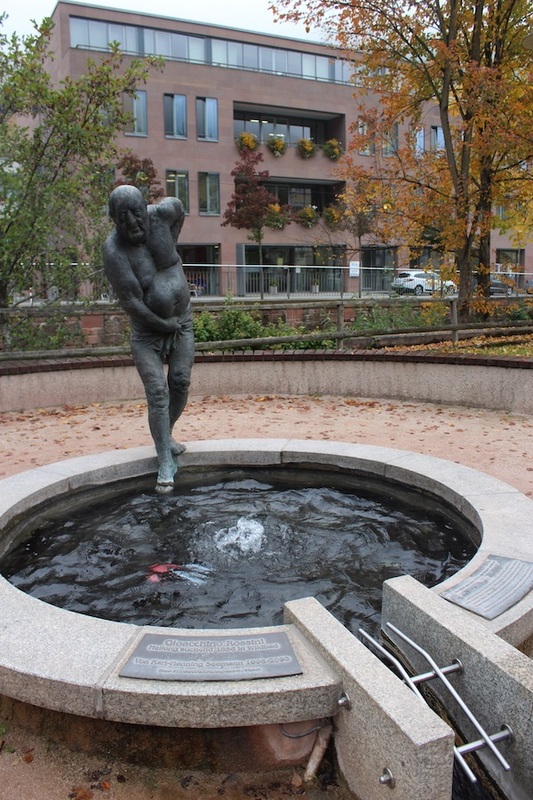 In Bad Wildbad, there was an invitation to all to come to the healing waters for recovery. 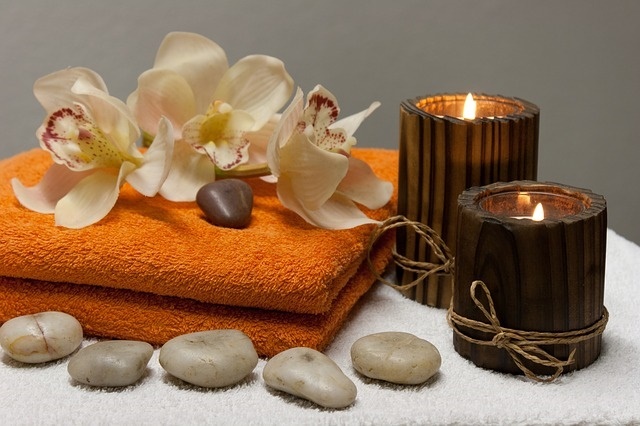 The first spa house was built in 1511 when sulfur springs were discovered and considered to be extremely helpful for sick people. Bad Wildbad was also a favorite for royalty and has several baths that catered to the elite. Today, everyone is invited. 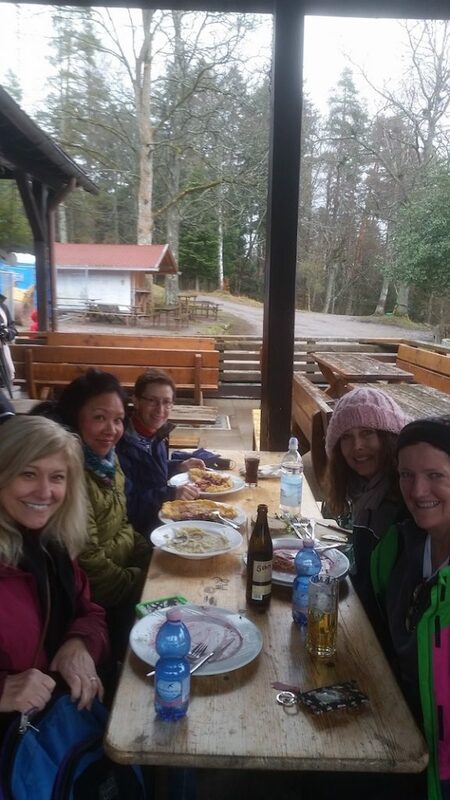 On the suggestion of my friend, Sigi, I took a group of hikers to the “Grünhütte” on the Hochmoor in the Black Forest. She suggested we try this little restaurant hut tucked away on a hill in the woods that has been serving “blueberry pancakes” for over 48 years. With an invitation like that, who could refuse? 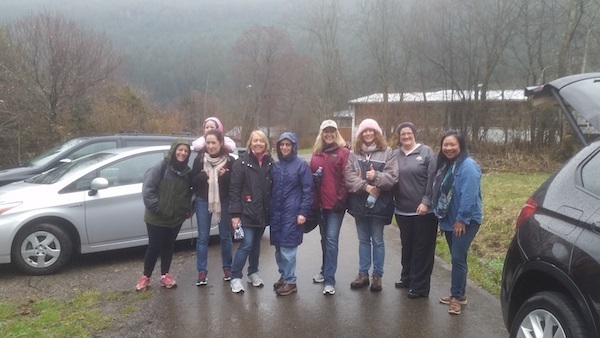 So with some mom, dad, kiddos’ hiking boots, we set off for a five mile hike (round-trip) up a large hill in the Black Forest. My husband and I had checked it out a few weekends prior to make sure we knew the trail and could field any logistical questions that might come up. The early March weekend we went it snowed and snowed and the mountains were covered. I was glad when we arrived to a warm, cozy cabin filled with people and great food. There are several hiking trails that lead to the hut, but we took the trail from Lautenhof just outside of Bad Wildbad. This trail is completely paved and uphill the whole way. 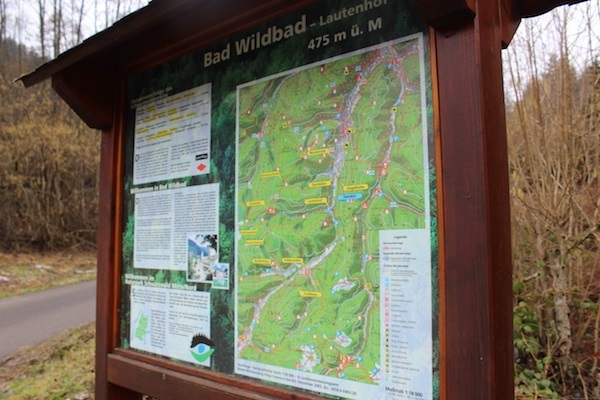 My friend, Sigi, had suggested we take the trail from Kaltenbronn which is about a half hour from Bad Wildbad. 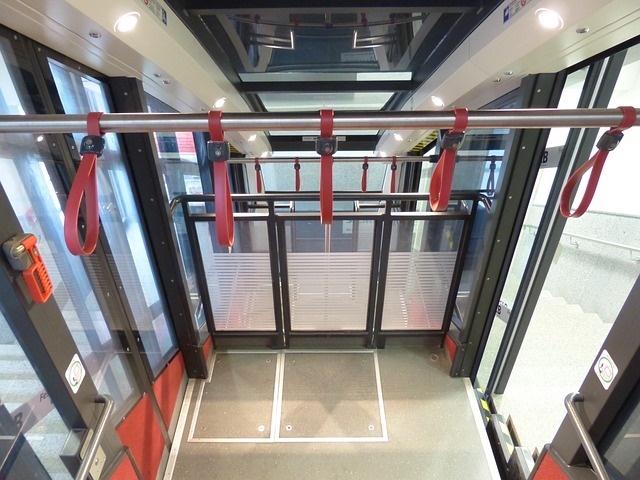 It also has a ski-lift for those not inclined to trek but to see the mountains from a different perspective. I think on our next visit this summer we will try this out. 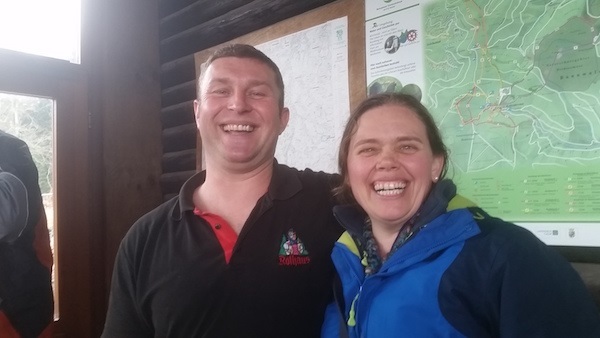 Now having been a few times, I’ve met Jacko who is a great worker with a welcoming smile and was very happy to see our hungry, cold, wet group of seventeen who made it up the hill. The pancakes are definitely worth every step. 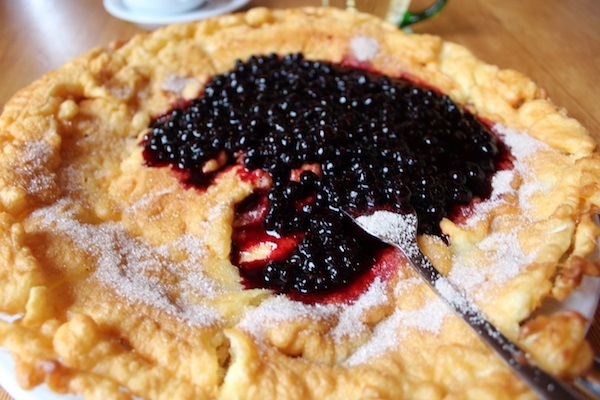 More like the “fried dough” we have in the states (not like flapjacks), they are unforgettable and delicious. Their full menu had different types of Maültaschen (a traditional German dish) and being Easter weekend, we tried some to fill our very empty bellies. By the way, the amazing “Gluhwein” (spiced red wine drink) was also made with blueberries. We all left with blue lips from the berries, happy lips and full tummies. They have limited indoor seating but a lot of outdoor seating. We noticed some construction beginning, so I think they might be in the process of expanding. Both times I have been, the restaurant has been full on the weekends. 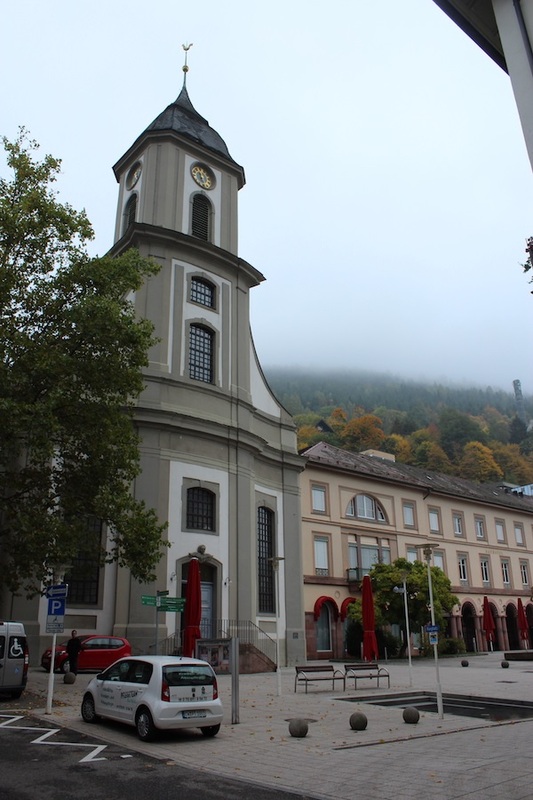 Here are a few places near or in Bad Wildbad worth checking out. I have yet to try out all of them, but some have blown up on social media. So I know they are worth mentioning and bringing the kiddos along for a fun day trip. By car Bad Wildbad is just over 1 hour west of Stuttgart, 2 hours and 15 minutes south of Wiesbaden and 2 hours and 15 minutes southeast of Kaiserslautern. For train information, click on DB Bahn.